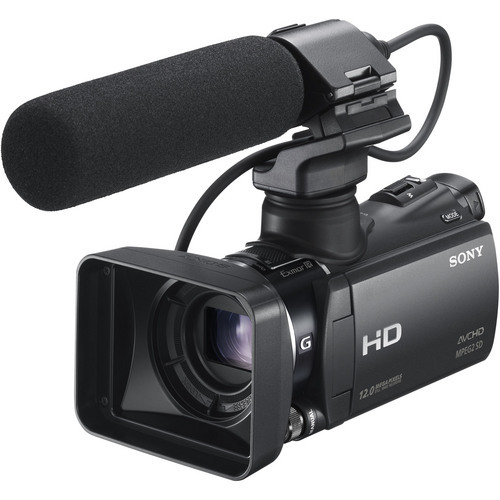 The Sony HXR-MC50U is a pro/prosumer-level camcorder that is packaged with a shotgun mic. 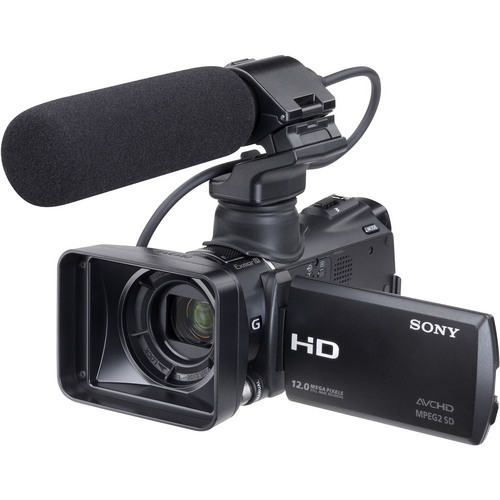 The MC50U captures 1080/60i AVCHD video at a max 24Mbps bit rate. The MC50U features a 1/2.88″ Exmor R CMOS sensor, 10x optical zoom and a 3.5″ touchscreen LCD. As for storage, the MC50U offers 64GB of internal flash storage as well as an SDHC/MemoryStick card slot for external storage options. The internal storage gives you about 6 hours of storage at the max resolution/quality setting. A 32GB SDHC card will, in turn, give you approximately 3 hours of storage. The storage space will easily outlast a single battery charge, which offers about 3 hours runtime, although higher capacity batteries are available. The camera is very compact and portable. The included shotgun mic can be quickly attached and detached for run and gun shooting. The built-in shock mount alleviates noise from handLing the camera and has an acceptably narrow pickup pattern. The shotgun mic attaches via a 3.5mm mic-in port – no XLR options are available, which lowers the professional use options for the MC50U. However, this setup keeps the package light and easy to set up. I was quite surprised at the audio quality and isolation that this rather plain shotgun mic delivered. I used it exclusively for interviews at NAB 2012, which was a very noisy environment on the show floor, and the mic performed swimmingly well. For the simple interviews I did there, it did exactly what I needed it too. Another great tool include with the MC50U is a compact matte box which slides on the front and then locks into place via an integrated ring that twists into a locked position onto the lens. Sony markets the MC50U in its professional line. And while some features hint at intended professional use, others will leave pro video shooters scratching their heads. 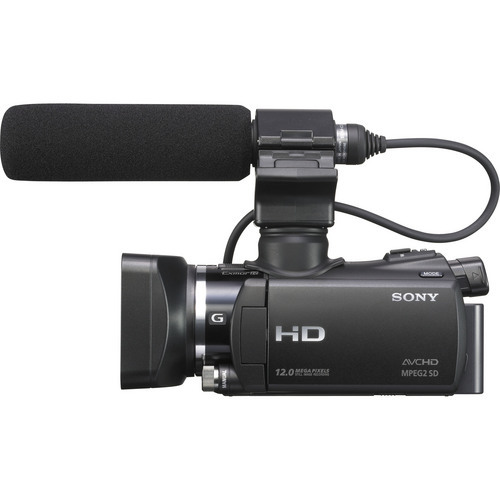 With such a small camcorder, it is probably no surprise that many of the camera’s features are buried in the menu system, which is accessible via the touchscreen LCD. And while that touchscreen works wonderfully well, it can’t come close to replacing the dedicate manual controls and shortcuts available on “more” professional camcorders. I can forgive a lot of the touchscreen access issues because the camera is so compact. The camera’s autofocus system is quite reliable and, more often than not, gave me the results that I was looking for. The dial on the left front of the camera gives you manual focus control when you want it. It works well enough for many situations; however, it takes some getting used to. The best that the camera will do for you is give you an estimated distance readout on the LCD while you turn the dial. There’s no expanded focus to help you dial in on fine detail. Likewise, there’s no peaking either. What you get in the MC50U is the ability to adjust the exposure up and down; however, you don’t get to define all of the parameters. You can control ISO/gain. You can control the iris. You can control the shutter speed. But you can’t control all three at the same time. Basically, an aperture or shutter priority mode for manual exposure is the most control you are going to get out of the MC50. This will be a deal killer for some, which is a shame because the camera is almost there. For those who can live without “real” full manual control, the image stabilization system is insanely awesome. I cannot believe what Sony is able to do with the Active mode Optical SteadyShot image stabilization. The MC50U has the best image stabilization system I have ever used in a camcorder. It is rock steady in the palm of your hand. For an example of the image stabilization and the isolation of the shotgun mic, check out this video at the Contour booth at NAB 2012. This was one of the louder booths and I was very concerned about the music they had cranked up. While you can still hear it, the roar of the crowd and the blaring music is muted quite well in this insane environment. Also note that the above video was completely handheld. No monopod, no shoulder mount, nothing. Just me holding the camera in the palm of my hand 4 feet or so away from the speaker. Another interesting feature on the MC50U is the dedicated NightShot infrared mode, which lets you shoot in complete darkness with the aid of an infrared led light on the front of the camera. However, the lens matte box blocks the infrared lamp, which means you’ll need to remove it before going into the dark. Below is a short video playing with the Xbox Kinect infrared motion tracking with the MC50U. Note that I covered up the onboard infrared lamp to make use of only the Xbox Kinect motion tracking lights. The Sony MC50U is really more a of a prosumer camera – but it’s a darn good one. The MC50U delivers enough performance across the board to turn a whole lot of heads at its $1500 price point. That said, some won’t be able to get past the lack of manual options. Don’t worry though. Another enticing compact “pro” camcorder is coming up from Sony – the Sony HXR-NX30, which looks to be a real winner across the board (complete with XLRs, 1080/60p and more) and weighing in at only $2000. If you don’t need XLR inputs and you don’t necessarily need to control iris, gain and shutter independently, the MC50U is an excellent all-around camcorder. 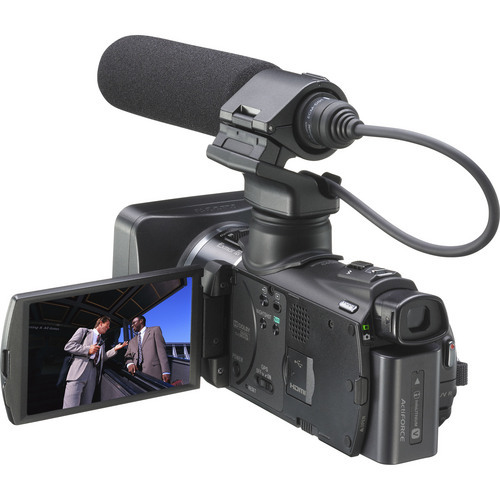 If you are tired of crappy audio and/or shaky footage from your camcorder, give the MC50U a try and you’ll be hard pressed to put it down.